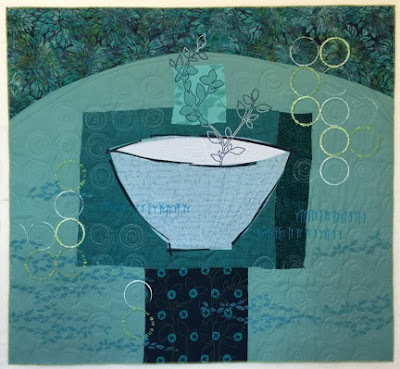 Deborah's Journal: Art Quilting Studio Give-Away! Hey! 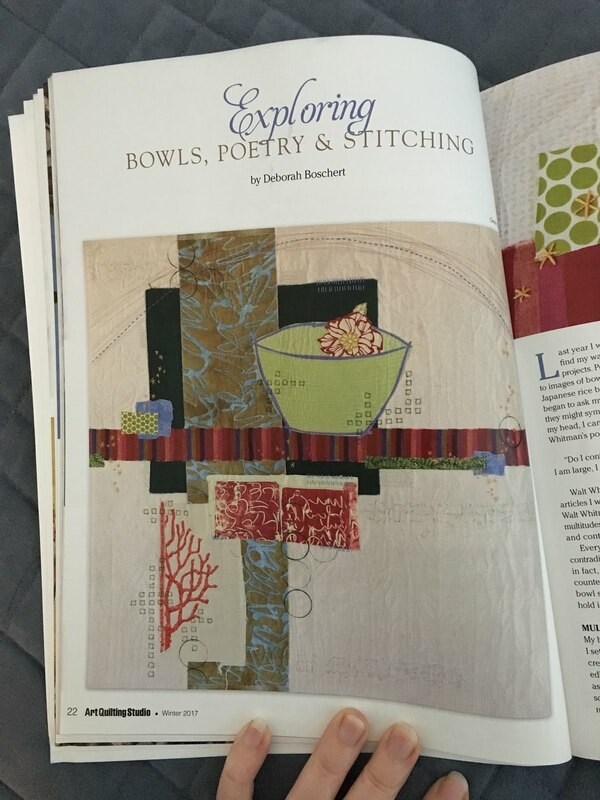 My bowl quilts are in the new issue of Art Quilting Studio. There are four quilts pictured including Nourished and Depleted. 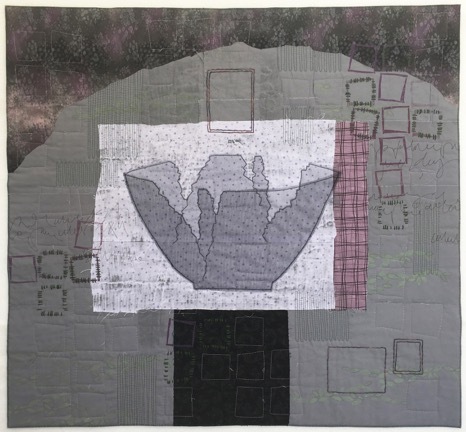 These two quilts have the same design, shapes and composition, but I set out to represent entirely different feelings. 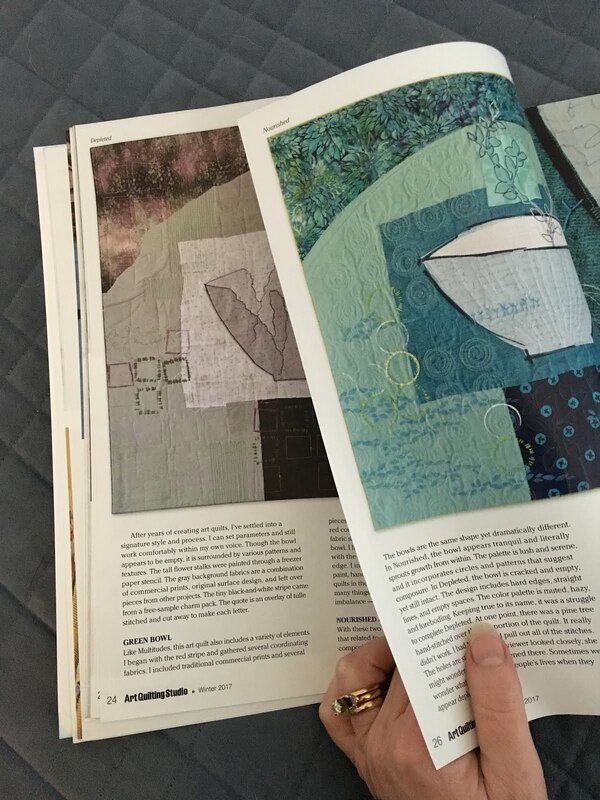 Here's a peak at the two quilts on the pages of the magazine. There are several other wonderful art quilters included in this issue! I am a big fan of Heather Dubreiul and Elena Stokes and I loved reading about their process and inspiration. Stampington is offering a free copy of Art Quilting Studio for me to give away to a blog reader! I hope you'll also sign up for my newsletter! Twice a month I share "Three Bits of Inspiration" from interesting sources and how I might apply them in my art and life. Plus news from the studio, upcoming events and lots of art! MaryAnn Littlejohn wins the magazine! Thanks for all your wonderful comments. I loved hearing what's filling your bowls. Oh, how I would love a copy of this fabulous magazine! Almost as much as I love eating a big bowl of Tillamook Mud Slide ice cream!!! I'm going to say "fish taco cabbage bowl" because I just finished one, and I really do like it. My favorite thing to eat out of a bowl is summer peaches and raspberries! I love that zine. I was in it years ago when I was actually doing some creating!! My favorite thing to eat out of a bowl is ramen. I'd love to win the magazine with your article in it (I've been following your blog and enjoy your posts). I'd put homemade vegetable stew in it on a cold night, followed by a bowl of chips when I'm watching TV! Thanks very much. My favorite: eating goldfish out of an orange little round bowl with my almost two year old grandson James at Christmas! He lives in Oklahoma and I'm in Ohio and oh dear, but I miss that little guy. Actually I would eat anything (um, let me clarify - ALMOST anything) out of a bowl with this cute little guy! Be still my heart! 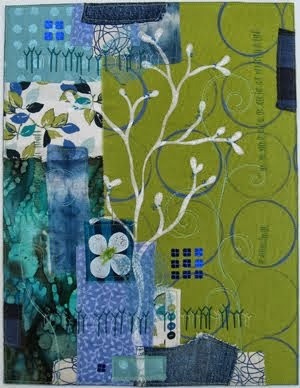 btw, I love your art, love to quilt, and having the magazine would be awesome! I always love a nice bowl of hearty soup or stew. In this cold weather we are experiencing a bowl of nice hot soup! My bowl would be full of nice, creamy oatmeal with brown sugar, milk, nuts and maple syrup, looking out the window on a snowy morning. Perfect way to start a cold day! Love your book, by the way. I would have to pick two things to eat out of a bowl that would be seasonal. Cold weather would find soup in my bowl and hot weather would find ice cream especially if it's homemade. Thanks for doing the give-away. I am sure whoever wins will enjoy the magazine. How wonderful for you to be published in this beautiful magazine! Thanks for the chance to win it. My favorite thing to eat out of a bowl is ice cream. Love to read about your work and process so this magazine would be a treat to read! My favorite thing to eat out of a bowl would be Cedar Crest Caramel Collision ice cream from Cedarburg, Wisconsin! 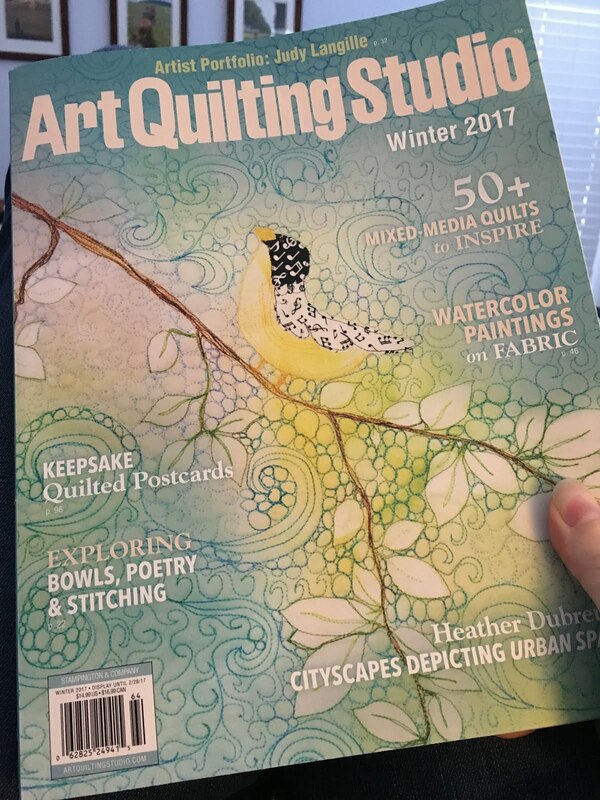 How exciting, congratulations on being published in Art Quilting Studio! Thanks for the chance to win a copy. Looking forward to reading the magazine. I love to eat Squash Soup (recipe by Sara Moulton that I have tweaked). I love to eat soup in a bowl. I love to eat my favorite homemade soup of spinach and meatball soup!!! I love to eat anything that has chocolate in it. The sweeter the better. Good luck to everyone who enters. I eat cereal every day out of a bowl! New to me magazine. 🙂 My favorite bowl food is good old ramen noodles in broth - cheap comfort food. Grin. Fresh Raspberries, although it's usually oatmeal every day. My favorite thing to eat out of a bowl is Bluebell Ice Cream made in Brenham, Texas. 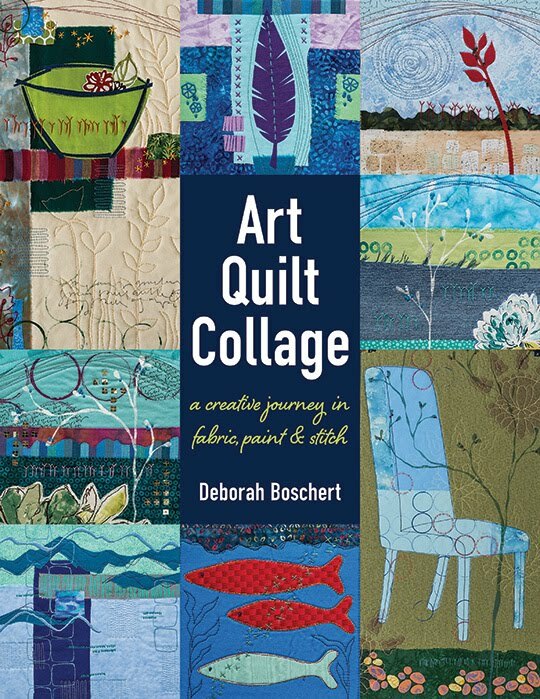 Looking forward to seeing you again at Fall Quilt Festival, Deborah. Congratulations on this lovely article. Best of luck to you this year. I so enjoY this magazine! My favorite thing to eat from a bowl is red raspberries and ice cream. Looks like a great issue! Congratulations on the article! My favorite thing to eat out of a bowl is an ice cream sundae. Yum. Schwan's Dark Cherry ice cream is delicious eaten from a bowl. mmmmmmm gooooood! A big serving of Yankee chili would fit so well in one of your beautiful bowls! I love your work. I'm so happy to see your work published in this great magazine. A bowl on chicken noodle soup would be great in your bowl. Breakfast - oatmeal with blipueberries and walnuts. Great issue, I got to see Carolyn's copy. Your work is amazing! Cobbler topped with ice cream is my favorite thing to eat out of a bowl. This time of year my favorite thing to eat out of a bowl is homemade soup! Thanks for the chance to win a copy of this magazine! I love hearty soup on a cold day! I look forward to seeing your magazine article - even if I am not the winner. Salad mix in a bowl at lunchtime is my healthy favorite. I have this "perfectly" shaped bowl which is the only bowl I LOVE eating out of. My palms cupped around the perfect slope of the sides. Kraft Mac and Cheese made really soupy with extra milk. Pasta, of course! Especially if it's smothered with some sort of creamy sauce. Congratulations Deborah! I love eating homemade chili from a handmade pottery bowl!! Well...I would say ice cream, but I eat that from a cone! So...I suppose it's homemade granola! Favorite thing to eat out of a bowl: salad! Recently got your book, Art Quilt Collage. Loving it! I find meals that can be served in a bowl comforting. Lately, one if my favorites to make at home (or pack for lunch) is variations on Korean Bi-Bim-Bop. Congratulations! Looks like a nice edition. My favorite thing to eat out of a bowl is soup, ice cream and oatmeal. 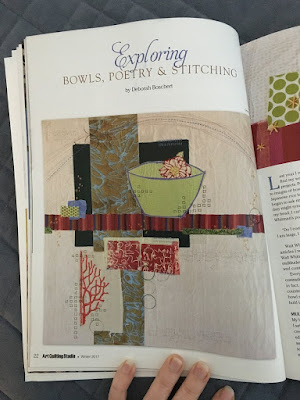 Love a chance to win the art quilting magazine with the article about your quilted bowls! And speaking of bowls, I like having a bowl of homemade soup throughout the winter months! My favorite thing to eat from a bowl is salad--with a mix of greens, red pepper, cauliflower, beets and other vegetables--a riot of colors and textures.